Today has been one of those filthy days we’ve been having so much of this winter which, frankly, I’m sick of. Intermittent rain showers, spurts of hail mixed with tentative peaks of watery sunshine until the afternoon deteriorated into a somber steady rain. Only an emergency could have roused me out of my house. I finished a book, did some light tidying, and pruned my unread emails, but as the day got grimmer, I began to feel that depressed lassitude that prolonged lack of sunlight causes. Then I remembered the homely smell of fresh-from-the-oven bread that had greeted me when I walked into a friend’s house yesterday and knew immediately what I should to try to do- bake yeast rolls to go with my lentil soup for supper. Having a mother that baked bread while I was a child had given me the sort of nebulous “muscle memory” of bread making- the foamy awakening of live yeast, the strands of gluten that form as dough is kneaded, the texture of properly kneaded dough, the satiny sheen on the outside of a taut ball of dough set to rise, and the thump on the crust and smell to announce a “done” loaf. But knowing what to look for is different from knowing how to get there and my independent attempts at baking with yeast have had mixed results. My pizza dough is well in hand, and oddly, a complex hearth loaf involving a two-day dough fermentation and a “poolish” has always been successful. But regular sandwich loaves have usually been damp and heavy and all of my attempts to make my favorite eggy challah bread have been horrible with none of challah’s characteristic pull-apart strands. So unlike other types of cooking with which I feel a strong degree of confidence, I always approach bread baking with trepidation. Looking through my cookbooks, I found a recipe that required a two-day rise in the refrigerator, one that needed powdered milk and potato flakes, and another that made about forty rolls. I’ve heard eternity described as “two people and a ham” and I think that “two people and forty rolls” could come pretty close. I’ve had good and consistent results with Southern Living cookbooks and used their basic roll recipe divided in half. 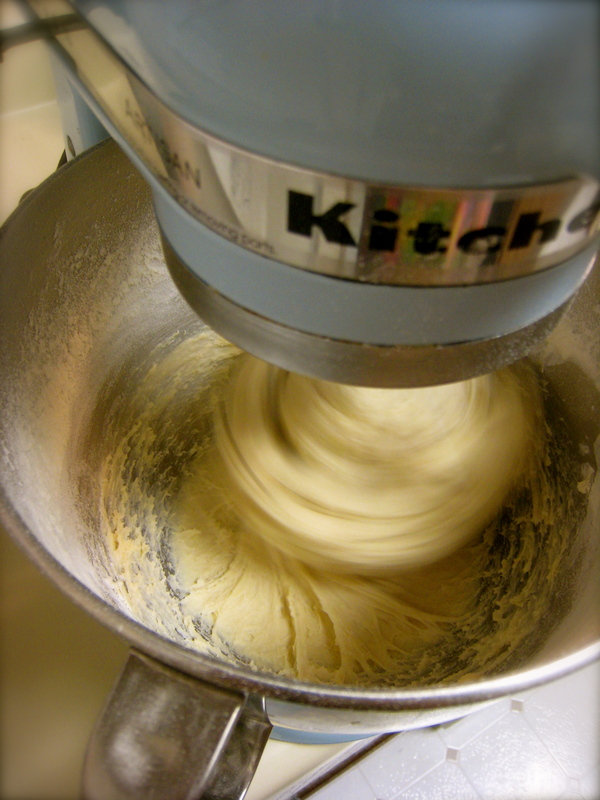 Combine 3 cups of the flour, the sugar, salt and yeast in a large bowl of a stand mixer. Combine milk, water and 1/4 cup of the butter in a saucepan and cook over medium heat until butter melts, stirring occasionally. Remove from heat and let mixture cool to 120 to 130 degrees F (49 to 54 degrees C). Gradually add milk to flour mixture and beat at low speed of an electric mixer for 30 seconds. Then beat for 2 minutes at high speed. Gradually stir in the remaining flour to make a soft dough. Replace the whisk attachment on your mixer with the dough hook and knead for about 5 minutes until dough is smooth and elastic. Place dough in a well greased bowl, turning to grease top. Cover and let rise in a warm place for about 1 hour and 15 minutes. Punch dough down, cover and let rest for 10 minutes. Melt remaining 1/4 cup plus 2 tablespoons butter. 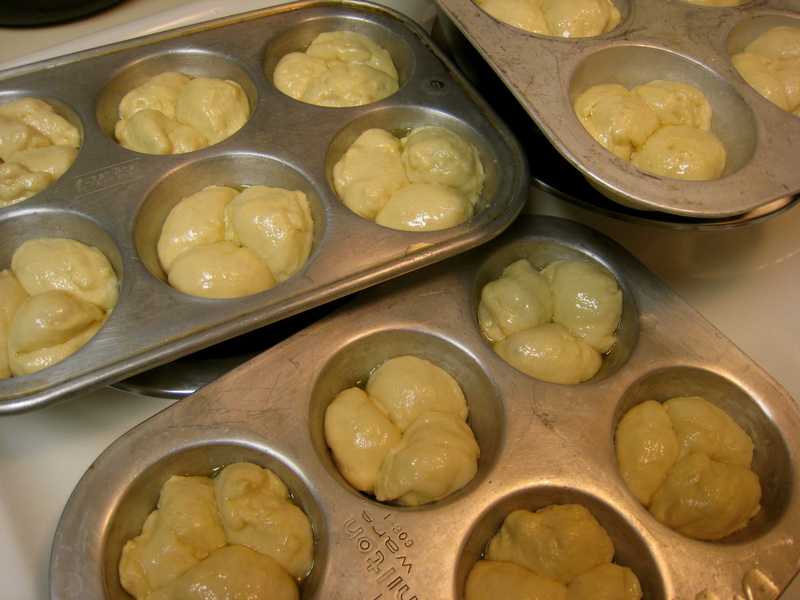 Shape dough into 40 balls and dip each one in the melted butter. Place the balls in two greased 9 inch square baking pans. Cover and let rise for 45 minutes. Bake in a preheated 375 F oven for 15 minutes or until rolls are golden. 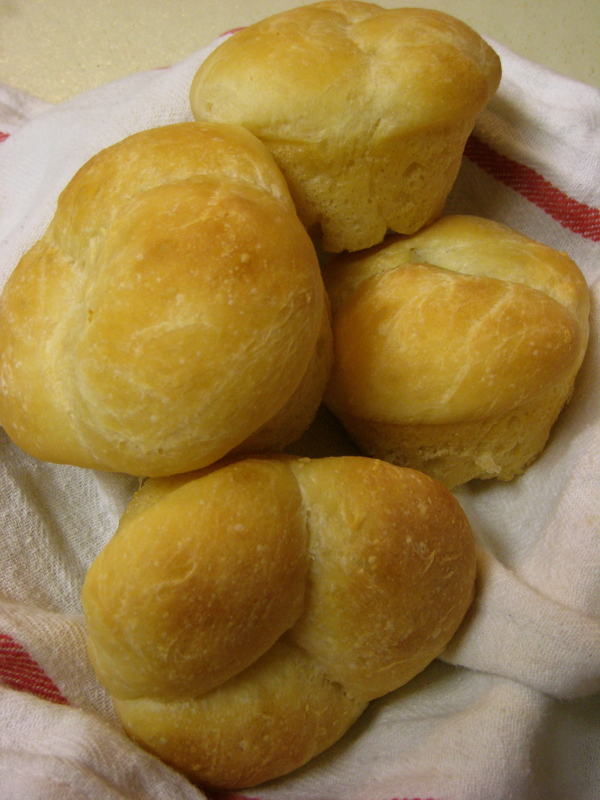 Brush warm rolls with any remaining melted butter. The only departure I took from the instructions was in forming the rolls. After the first rise, I punched down the dough and began squeezing grape sized balls off of the big ball of dough. Each piece was rolled smooth between my palms and dipped into a bowl of melted butter. 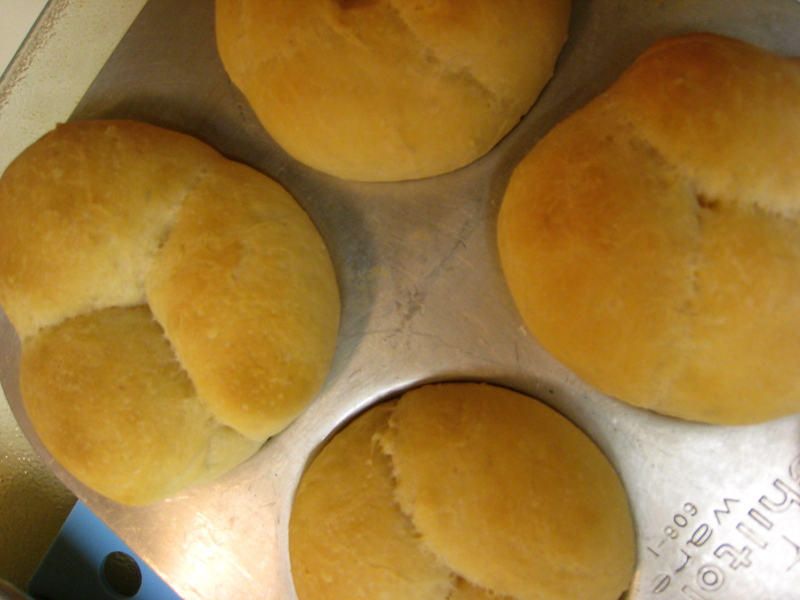 I put three small dough balls into each hollow of generously buttered muffin tins to form a cloverleaf roll. If you’ve ever had monkey bread, the cloverleaf roll is the same concept, a pull-apart loaf, on an unsweetened and miniature scale. Since one of the most common problems that bakers have is incorrect oven thermostats, resulting in too low temperatures and under baked bread, I recently got one of those little low tech oven thermometers to get a more accurate read. My oven varies from between 15 and 25 degrees off! No wonder my loaves had been doughy! It’s really helpful to be able to adjust the oven to the correct temperature for almost any type of cooking but it’s pretty crucial for baking. You can pick one up for about $4 at most hardware stores. So, rolls are rising and the oven is preheating to the correct temperature. Soup is on the stove and already the day seems a little less grim. It’s remarkable what good smells can do for a bleak mood. Fifteen minutes before suppertime, I hopefully slide my muffin tins into the oven and hope for the best. Golden, buttery, and yeasty, they emerged to be immediately fallen upon like a pack of hungry wolves. We’re burning our fingers and tongues to get at them- they smell so good! They have that golden top and lightly crisp buttery outside while the interior pulls apart to a light and airy texture that yeast and gluten combine to make. Mmmm. Maybe I’ll actually be able to crack this baking thing. MMMMMMmmmmm! I can almost smell them! “2 people and 40 rolls” though made me laugh out loud. If you want my daily travel emails, let me know with your email. back laughing . You CAN freeze the bone for soups, cube the ham for adding to mac n’ cheese and pea soup and freeze slices for sandwiches. Still laughing with tears.